American Airlines Group Inc. is about to give coach passengers even less legroom. The company will shrink the space between most rows to 30 inches (76 centimeters) on its newest Boeing Co. 737 jetliners, spokesman Joshua Freed said Wednesday. That’s an inch less than on its existing 737-800 planes. At least three rows on the new 737 Max jets will have only 29 inches, moving the world’s largest carrier closer to the offerings of deep discounters such as Spirit Airlines Inc. and Frontier Airlines. American’s effort marks the latest push by U.S. airlines to cram more passengers onto each plane by using new, slimmer seat designs that are supposed to maximize room for a passenger’s knees even as rows move closer together. America’s newest contribution to the so-called densification trend will begin in the third quarter when the carrier takes delivery of its first 737 Max planes. He declined to identify which rows will have the least legroom. The Max will have 172 total seats, including 36 in Main Cabin Extra, a higher-priced option with more leg room than the rest of the coach section. American will receive four of the narrow-body 737 Max planes this year and 16 in 2018. It has 100 on order with Boeing. The change may signal that American is ready to challenge the super-discount airlines for customers rather than battle with Delta Air Lines Inc. in particular over business travelers, said Alan Bender of Embry Riddle Aeronautical University. Having more seats means American can sell more lower-priced tickets. American is considering similar changes for any new 737-800 planes, Freed said. The airline raised the seat count on its 737-800s to 160 from 150 starting in 2015. It also had increased seats on its wide-body 777-200 jets to 289 from 247. The Max will retain a first-class cabin with 16 seats. The spots with less pitch — or the distance from the back of one seat to the same spot on the one in front of it — won’t be part of American’s Basic Economy fare, which comes at a lower price but with no extra frills. The changes may also further split coach passengers from those flying in business or first class, Bender said. Southwest Airlines Co. took advantage of new slimmer designs to add six seats to most of its 737s as part of a cabin refurbishing in 2012, and Delta took similar steps three years ago. 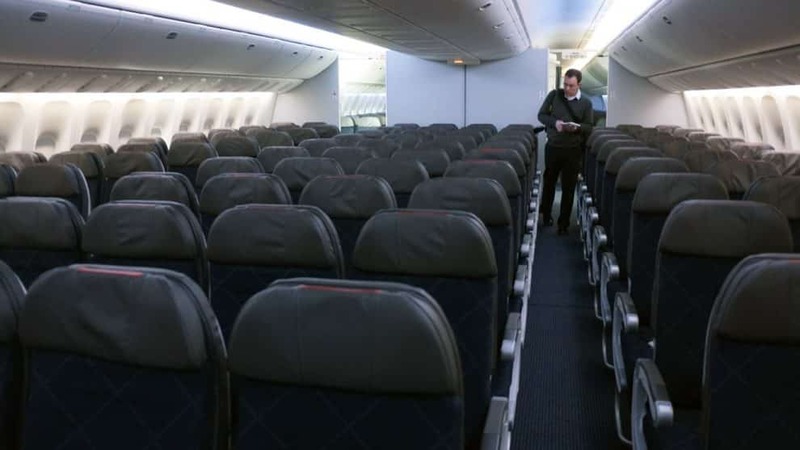 CNN earlier reported American’s plans to reduce the space between rows on the 737 Max.